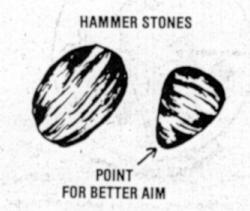 Here's a refresher for stone knappers and those of you who would like to get away from blown glass and begin to make some real works of art with flint, obsidian or other natural materials. To begin with, determine a workable material by looking for conchoidal fracturing. 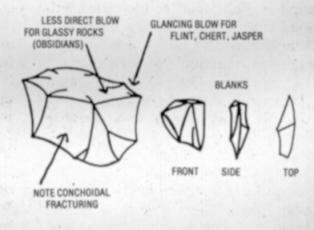 This means the material will fracture in an arc, forming a dished (or domed) surface. Stones which fracture in straight line, or angular planes, do not work as well and should be avoided to start with. One of the best overall liths to work with is obsidian, in terms of ease of flaking, sharpness (the sharpest), and great beauty. Obsidian comes in a wide variety of colors: black is the commonest, sometimes translucent, ("Apache tears" are obsidian-pebbles, polished by sand, wind and water). Red and black, or "mahogany", is also fairly common. Other varieties include grey (usually opaque) which tends to a bit harder to work with. Snowflake, which is black with white "snowflake" inclusions, tends to present problems with getting a proper edge, as the more crystalline nature of the inclusions, they will flake or fracture differently (almost crumble) from the surrounding black matrix of the obsidian proper. Most varieties of obsidian can be purchased from rock shops in large enough pieces or cores to get good blanks from. Since they are sold as lapidary material, they are generally "sound" rocks. Another excellent material is jasper which come sin a wide variety of colors, combinations of colors, and hardnesses. It also has a glassy look, like obsidian, but is not translucent. Don't confuse picture jasper with picture stone. Picture stone is actually a sandstone, and will not have a glassy, polished look to it when in an unworked, rough state. Flint and chert, of course are the two most widely used materials of the native Americans. They are basically of the same mineral composition, being mostly fine grained quartz, the microscopic quartz crystals cemented together by a matrix of "impurities". There are many varieties and colors of both, flint being primarily black, translucent sometimes, or grey. Chert is used to describe tan or white material. Chert will also have brown, yellow, red, or blue colors too, the colors derived from other minerals within the matrix. Flint and chert are very hard sedimentary rocks, and often need to be heat treated before they can be worked. Heat treating is a rather involved process, though simple enough to do. 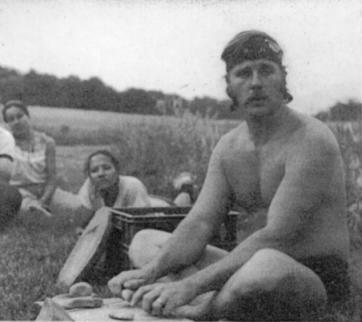 A good book which covers all the elements of flint and chert and the heat treating of them is The Art of Flint Knapping, by D. C. Waldorf. Step one is to get blanks off from the core. 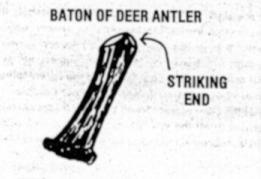 The first method is by direct percussion: striking the edge of the core with a hammerstone (granite makes a good hammerstone) or a baton of deer antler. Remember! A glancing blow to the edge. A direct blow will simply shatter the core. With glassy-type rocks (obsidians) a very indirect glancing blow is used. With the harder materials (jaspers, cherts and flints), a more direct, though still glancing blow is needed. 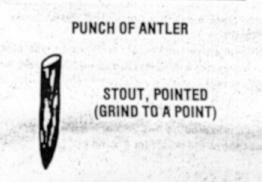 Indirect percussion, using an antler punch, now removes any unwanted knobs or high spots on the blanks. An anvil or work surface is needed -- either a flat piece of hardwood or a large rock. 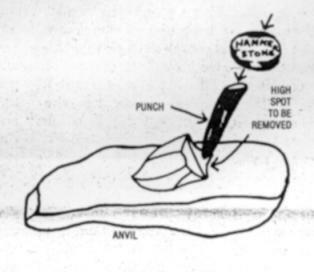 The blank is placed on the anvil and held down with one hand, leaving the thumb and forefinger to hold the punch to the area to be removed, and striking the end of the punch with the hammerstone. Percussion flaking is now employed to thin the blank down. 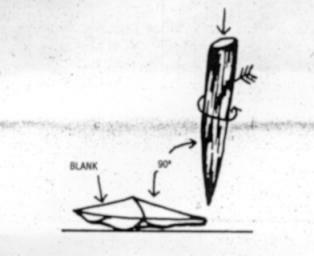 Holding the blank on the anvil, the antler punch is placed on the edge of the blank or along one side of any "squared" edge, then striking the punch with the hammerstone, peeling large flakes off across the face of the blank. Crumbling now achieves the basic shape of the tool to be fashioned. Placing the blank on the anvil, or now in the hand mitt, flat sides down, with a large pointed antler tine held at a 90-degree angle to the edge desired, press down with a rolling twist and crumble the edge away, working along the edge to get the basic shape. Abrade (or grind) the edge (held at a 900 angle) upon a piece of hard sandstone or other rock to get an even working surface, smoothing out the tough spots from the crumbling process. Next, pressure flaking begins the actual process of producing an edge on the shaped blank. Holding the lank in the handmitt, and starting out with a large flaker of antler tine, press directly into the edge, and with a rolling, downward motion peel flakes off across the face of the blank. The more pressure exerted into the edge, the larger the flakes which will come off. 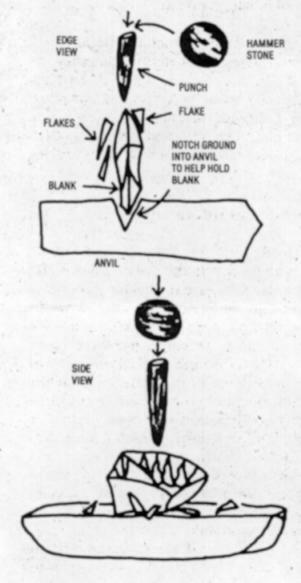 Remember, by placing the flaker on the edge, and rolling down, the flakes will come off the underside of the blank as its held in the handmitt. Work all along the edges and from both faces of the blank. 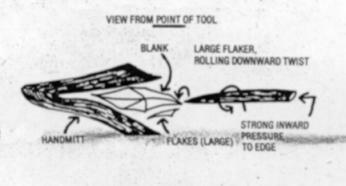 Repeat the process with smaller flakers as necessary depending on the size of the tool being made. 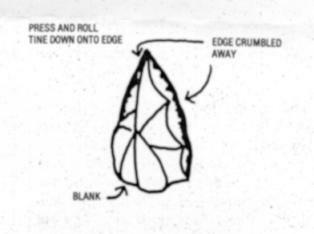 The actual technique of knapping takes very small flakes off along the edge, and produces the final razor sharpness. 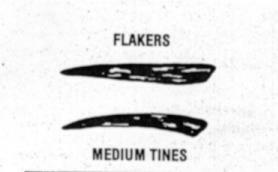 Using very pointed, sometimes almost needlelike flakers of antler, remove the flakes with the same inward pressure, and rolling downward twist as is used in pressure flaking. 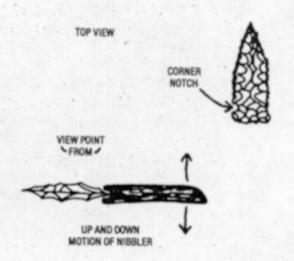 Nibblers are antler tines with a notch ground into the end, and are used to crumble the notches into the bottom corners of the point, the notches, of course, used to lash the point to the arrow shaft. Pressure flaking also works to flake the notches.